Whether you’re a professional hairdresser or barber who cuts hair on a frequent basis, a hair client who gets your hair cut by a pro or a hair consumer who cuts your family’s hair, at some point anyone who has hair, male or female, may eventually come into contact with hair clippers. Of course whether or not your hair is cut with clippers depends on a variety of factors starting with the type of hairstyle you wear. Although I went to beauty school and I learned to cut mannequin, as well as human hair, with hair clippers, my own hair is primarily cut with scissors. Males, on the other hand, especially those that go for a shorter look will often have their hair shortened with hair clippers. Yes, some females go with very short hairstyles but clipper cuts may be less common, in general. When Jane, played by Demi Moore, in the movie G.I. Jane ran into the post barber shop and grabbed a clippers and proceeded to shave her hair, she was using electric hair clippers. However, many women may rarely have their hair cut with electric clippers and may instead receive scissor cuts. While it’s also true that many men prefer scissor cuts, in general males tend to be more likely to experience electric clipper cuts than females. As a point of interest, Demi Moore actually shaved her head in the movie to make sure the scene was realistic. For several months after the movie her hair was growing out from her G.I. Jane look. Hair clippers are manufactured basically by a handful of worldwide manufacturers but marketed by several companies. Generally speaking hair clippers are made for hair professionals who use them in their daily hair work and require a robust tool and they are made for hair consumers who use them on a less frequent basis. Some of the best-known brands for electric hair clippers, which may be available for hair professionals as well as hair consumers include (in no particular order) Wahl, Andis, Oster, Conair, Remington, Hot Tools, Philips Norelco and others. Professionals and consumer often buy electric hair clippers because of a longstanding relationship with a particular company or for a wide range of reasons (price, availability, consumer ratings, recommendations for other professionals, etc.,). 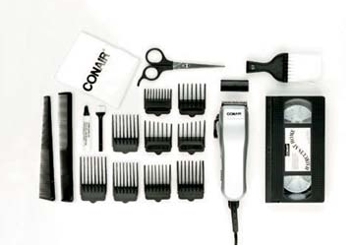 Whether you wish to buy an individual hair clipper or a set, the options are endless. 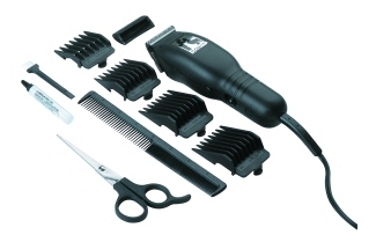 Electric clippers are available both with and without cords. 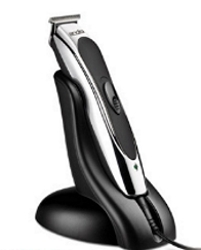 The cordless clippers come with a charger in order to recharge the clipper inbetween use. Some people prefer the cord variety while many prefer the cordless. Many times it is simply a matter of personal preference. 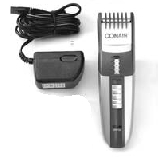 An electric hair clipper is basically a small electric motor attached to a cutting blade and covered with a type of protective casing. The motor of the hair clipper is connected to the blade so that it moves from side to side. Generally speaking hair clipper blades move from side to side, up and down, Look at a hair clipper while it’s running and you will be able to see how the blade moves. It moves slightly up and down as well as the desired side to side motion. Besides a blade attached to the motor are what is known as blade guards. Is most cases hair clippers are sold with detachable combs in a variety of sizes which controls how close you can clip the hair to the scalp. Depending on the clipper you buy it may come with just a few blades or several. Always check to make sure the length you prefer is provided with the clipper you buy. 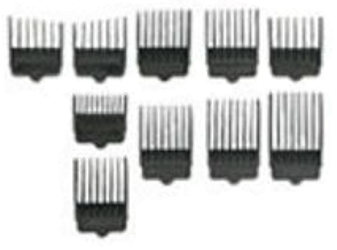 (Image to the side various Blade Guards – Clipper Attachment Combs – HairBoutique.com – All Rights Reserved). Some people prefer to use an electric hair clipper without any attachment which will give the absolute closest cut. Others prefer certain uniform lengths which the clipper attachments provide. 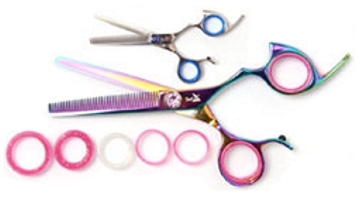 Listed below are the standard blade guard lengths ranging from closest cut to longest hair length. Keep in mind that the actual guards included with a clipper may vary by manufacturer. Also note that when a kit is purchased with the razor other tools may be included. Regardless whether you are a professional or a consumer, if you have invested in an excellent pair of electric razors its important to maintain them so they remain in tip top condition. Razors that are not maintained may not provide the best long term hair cuts. When I was in cosmetology school one of our instructors told us to use Barbicide to clean the electric razor heads. One thing about beauty school is that you use Barbicide for just about everything. I always had a gallon of it in my school locker to refill my station bottles. Hair pros will always have Barbicide or a simlar disinfectant available. Our instructor taught us to remove the head of the clipper from the body and soak the clipper heads in Barbicide. Then use a soft brush, even an old toothbrush to gently brush inside all of the blades. This removes any caked on hair or dirt and guarantees the blades are completely disinfected. Be sure to completely and thoroughly rinse and dry the blades to avoid rust from forming. You may even want to let your blades air dry on a clean towel to guarantee they are completely dry before reassembling the head to the body of the clippers. It is also important to oil the clippers with the recommended oil to keep the blade heads operating smoothly without sticking. Making sure the heads of the razor is completely sterile is more important to a professional hairdresser or barber who uses their clippers for multiple clients. This may not be as important to a hair consumer who only uses their clippers for themselves but may be more appropriate if clippers are used on multiple heads. While the above maintenance and sterilization tips are excellent for professional hair dressers, I would like to caution that regardless whether you are a pro or consumer hair cutter, always read the operating instructions of any hair clipper you purchase completely before using. If you have any doubts about the clipper, always contact the manufacturer of the item. When in doubt always ask questions. It will save you time, money and any long term electric clipper operational problems. 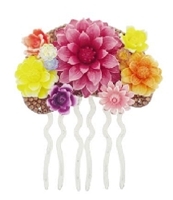 This entry was posted on Saturday, April 11th, 2009 at 7:34 am	and is filed under Hair, Hair Cutting Tools, Hairstyling Tips, Men's Hairstyles. You can follow any responses to this entry through the RSS 2.0 feed. Both comments and pings are currently closed.